The theory of yin-yang originated in antiquity in China. It is a theory dealing with the origination of the universe as well as the motion and variation of all things in the natural world. It holds that the natural world is made up of materials and that the material world conceives, develops and constantly varies under the interaction of yin and yang, The philosophers and doctors in ancient China explained all the phenomena and the nature of the universe and life with the theory of yin-yang. They regarded the opposition, the wane and wax as well as the variation of yin-yang as "the law of the universe". People in ancient China held that the original state of the universe was "qi"; and that the motion and variation of "qi"; produced two poles known as "yin" and "yang", Such a process of transformation was called " to divide one into two", Since all the things in the universe are produced through the motion and variation of qi, everything can be divided into the aspects of yin and yang, such as the heaven and the earth, the day and the night, the water and fire, upper and lower, cold and heat as well as man and woman, etc. The original meaning of yin and yang is simple and specific, mainly referring to the sides facing and opposite to the sun. 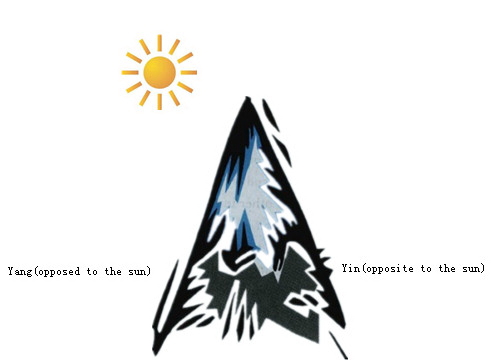 That is to say that the things facing the sun pertain to yang while the things opposite to the sun pertain to yin. In Chinese "yang" means "sunshine" while "yin" means "shadow". Later on specific things related to yin and yang were abstracted to induce a series of properties in the light of yin and yang. In this way yin and yang, two special signifiers, gradually evolved into a theory of extensive application. Consequently the implication of yin and yang was extended. The properties of things signified by yin and yang are quite abstract. In order to make the meaning of yin and yang explicit, people in ancient China used specific things, namely water and fire, as metaphors to analogize. Since water and fire are opposite to each other in nature and reflect the basic characteristics of yin and yang, they are used as the signifiers of yin and yang in Huangdi Neijing. Comparatively speaking, fire is warm, bright, active and up-flaming; while water is cold, dim, static and downward-moving. That is why it is stipulated in Huangdi Neijing that "water is yin and fire is yang". Fire and water are the evidences used to categorize things because they are the signifiers of yin and yang. Generally speaking, the things and the phenomena that bear the properties of being warm, bright, active, rising and dispersing pertain to yang; while the things and the phenomena that bear the properties of being cold, dim, static, descending and astringing pertain to yin. According to such criteria, all things and phenomena can be categorized into either yin or yang group. However, the yin and yang properties of things are relative, not absolute. In the categorization of things according to the nature of yin and yang, two points have to be taken into consideration. 1.The yin or yang properties of things may vary with the change of time and application. Take spring and summer for example. It is comparatively hot in summer and cold in spring, so summer pertains to yang and spring to yin. Take spring and winter for another example. It is comparatively cold in winter and warm in spring, so winter pertains to yin while spring pertains to yang. 2.Any aspect of yin and yang in an object can be further and infinitely divided. In this case there exists yin within yang and yang within yin. Take daytime and night for example. Daytime pertains to yang while night to yin. However, daytime can be further divided into two phases: morning and afternoon. Since yang-qi ascends in the morning and descends in the afternoon, morning pertains to yang (yang within yang) and afternoon to yin (yin within yang). Similarly, night can be divided into anterior night and posterior night. Since yin-qi increases in the anterior night and decreases in the posterior night, anterior night pertains to yin (yin within yin) while posterior night to yang (yang within yin). The yin and yang aspects within an object or phenomenon are not simply arbitrary divisions. In fact they are in constant and complicated interaction. Such interactions between yin and yang give rise to the origination, development and change of things. The interactions between yin and yang are various in manifestations. The following is a brief description of the major ones. Since yin and yang are opposite to each other in nature, they constantly repel and restrain each other. If both yin and yang are quite powerful, such a mutual repelling and restraining activity will maintain general equilibrium of things. If one side is weak and the other side is strong, the strong side will restrain the weak side, consequently damaging the general balance of things. The so-called "contrary treatment", one of the basic therapeutic principles in TCM, is developed in the light of the opposition between yin and Yang. For example, the treatment of cold disease with drugs hot in nature means to use heat (yang) to control cold (yin) while the treatment of febrile disease with drugs cold in nature means to use cold drugs (yin) to restrict heat (yang). Since the drugs used and the diseases treated are different in nature, such a treatment is termed "contrary treatment". "Contrary" means "opposite". Interdependence between yin and yang, literarily yin and yang rooting in each other, indicates that yin and yang depend on each other for existence in an object. In conception, yin and yang must exist in pair and no side can exist solitarily. In nature, yin and yang within an object can transform into each other under certain condition, implying that no one can exist without the existence of the other. That is why it is said in the theory of TCM that "solitary yang cannot exist"; and "solitary yin cannot grow". In the light of interdependence between yin and yang, TCM pays much attention to mutual transformation between qi and blood as well as yin and yang in the treatment of diseases due to deficiency of qi and blood as well as of yin and yang. For example, the patients with blood deficiency can be treated by supplementing qi to produce blood, the patients with qi deficiency can be treated by supplementing blood to promote qi, the patients with yin deficiency can be treated by supplementing yang to generate yin (also called "drawing yin from yang";) and the patients with yang deficiency can be treated by supplementing yin to promote yang (also called "drawing yang from yin";). Wane and wax between yin and yang implies that, in the interaction between yin and yang, one side is developing while the other side is declining and vice versa. Such a state manifests in different ways, such as yin waning while yang waxing, yin waxing while yang waning, yang waning leading to yin waxing, and yang waxing leading to yin waning. Under normal condition, wane and wax between yin and yang are maintained to a certain range. Waning to a certain degree will turn to waxing and waxing to a certain level will change into waning. In this way wane and wax will never be excessive. Alternation and repetition of wane and wax maintain a dynamic balance between yin and yang. If wane and wax between yin and yang exceeds the normal level, relative predominance or relative decline of either yin or yang will arise, consequently damaging the dynamic balance between yin and yang and leading to imbalance of yin and yang. If yin or yang wanes or waxes to the extreme point, it will turn to the opposite. That means yin will change into yang and yang into yin. The key element involved in such a mutual transformation is the degree of wane and wax. The degree that leads to transformation is termed "extreme point" or "excess"; in TCM. In Huangdi Neijing, it suggests that "extreme cold generates heat", "extreme heat generates cold", "excessive yin turns into yang" and "excessive yang changes into yin"; , all reflecting mutual transformation relationship between yin and yang. The typical mutual transformation process of yin and yang is well signified by the variations of yin and yang in the four seasons of a year. From spring to summer, yang waxes while yin wanes. However when such a transformation reaches the peak - the Summer Solstice, yin begins to wax while yang starts to wane. From autumn to winter, yin waxes while yang wanes. But when such a transformation reaches the peak—the Winter Solstice, yang begins to wax while yin starts to wane. Such a change exactly explains the idea that "excessive yin turns into yang" and "excessive yang changes into yin". With the wane and wax of yin and yang, cold and heat in the climate also alternate. Such an alternation vividly demonstrates the theory that "extreme cold generates heat" and "extreme heat generates cold". TCM (Traditional Chinese Medicine) believes that the human body is an organic whole and that all the tissues and organs in the body depend on each other in function. Such interdependence between these tissues and organs can also be explained according to the theory of yin and yang. That is why it is said in Huangdi Neijing that "man has a physical shape which is inseparable from yin and yang". 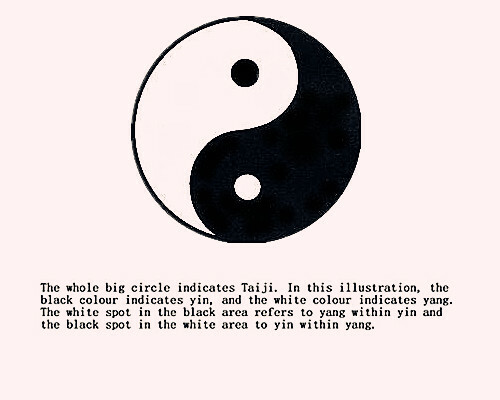 Generally speaking, the upper part of the body pertains to yang while the lower part to yin; the exterior pertains to yang while the interior to yin; the back pertains to yang while the chest and the abdomen to yin; the chest pertains to yang because it is located in the upper part of the body while the abdomen to yin because it is located in the lower part of the body; the lateral sides of the four limbs pertain to yang while the medial sides to yin. As to the zang-organs and the six fu-organs, the five zang-organs pertain to yin because they store essence, but never discharge it; the six fu-organs pertain to yang because they transport and transform food, but never store it. Among the five zang-organs, the heart and the lung are located in the chest, so they pertain to yang; but the liver, the spleen and the kidney are located in the abdomen, so they pertain to yin. Each organ itself can be further divided into yin and yang aspects, such as heart-yin and heart-yang, kidney-yin and kidney-yang, etc. The theory of yin and yang holds that the normal activities of life result from the balance between yin and yang and that the close relationship between histological structure and physiological functions signifies the opposition and the unity between yin and yang. The histological structure of the body, including the viscera, the meridians, qi, blood and body fluid, all pertains to yin because they are all substantial. However, their functions all pertain to yang. Thus there is an intrinsical relationship between substances that pertain to yin and functions that pertain to yang, i.e, the mutual opposition, interdependence, wane and wax as well as transformation of yin and yang. In terms of the interdependence between yin and yang, the human body relies on the viscera, the meridians, qi, blood and body fluid to perform and maintain its physiological functions. On the other hand, the metabolism of qi, blood and body fluid depends on the functional activities of the related viscera. Similarly, the performance of various functional activities will inevitably consume qi, blood and body fluid. This process is marked by wax of yang and wane of yin. Besides, constant transformation and generation of nutrients must rely on the functional activities of the viscera and consume certain amount of energy. This process is characterized by wax of yin and wane of yang. This process of metabolism is also accompanied by mutual transformation of yin and yang between substances and functions. Only when the balance between yin and yang is ensured in this series of physiological process can normal state of life be maintained. When the balance between yin and yang in the body is damaged, it leads to various diseases known as "imbalance between yin and yang". Though complicated, pathological changes generally fall into two categories: relative predominance of yin or yang and relative decline of yin or yang, according to the analysis of pathogenesis with the theory of yin and yang. Medical scientists can carry out symptomatic treatment and giving appropriate hygienic measures. Relative predominance of yin or yang, a pathological change due to excessive increase of yin and yang, includes two aspects: relative predominance of yin and relative predominance of yang. Yin or yang that becomes predominant inevitably turns into a pathogenic factor. So predominant yin becomes a pathogenic factor of yin nature and predominant yang becomes a pathogenic factor of yang nature. Relative predominance of yang, usually caused by invasion of pathogenic factors of yang nature or exuberant heat transforming from the pathogenic factors of yin nature activated by yang, is a manifestation of excess-heat syndrome known as "predominance of yang leading to heat" in Huangdi Neijing. Pathogenic factors of different nature impair the corresponding healthy qi in the body. So pathogenic factors of yang nature tends to consumption of yin-fluid in the course of pathological changes. That is why it is said in Huangdi Neijing that "predominance of yang leading to disease of yin. "; "Disease" here means impairment. For example, invasion of pathogenic heat into the body will make yang-qi in the body hyperactive, leading to high fever, sweating, reddish complexion and rapid pulse. With the progress of the morbid condition, pathogenic factors of yang nature consume yin fluid in the body, bringing on thirst, scanty urine and constipation. Relative predominance of yin is usually caused by invasion of pathogenic factors of yin nature into the body, leading to exuberance of yin-cold and bringing on excess-cold syndrome known as "predominance of yin leading to cold" in Huangdi Neijing. If pathogenic factors of yin nature further impair yang-qi in the body, a pathogenesis of "predominance of yin leading to disease of yang" will arise, as is recorded in Huangdi Neijing. Take pathogenic cold for example. When it invades the body, it leads to cold symptoms like aversion to cold, cold limbs and cold abdominal pain on the one hand; and symptoms due to yang-deficiency like floating whitish complexion, lassitude, frequent lying on bed, slow and weak pulse on the other hand. Besides, when relative predominance of yin or yang develops to the extreme point, mutual transformation will occur under certain condition according to the principle of inter-transformation between yin and yang. That is to say that yin-cold syndrome will turn into yang-heat syndrome and vice versa. Relative decline of yin or yang refers to pathological changes of yin or yang that declines below the normal level, including relative decline of yin and relative decline of yang. This morbid state mainly results from insufficiency of healthy qi in the body. To be specific, relative decline of yin refers to insufficiency of yin-fluid and relative decline of yang to insufficiency of yang-qi in the body. Usually relative decline of yin or yang leads to the imbalance between yin and yang which brings on hypofunction of the viscera. Relative decline of yang refers to deficiency-cold syndrome due to insufficiency of yang-qi that fails to restrain yin-cold and warm the viscera. The usual clinical symptoms are whitish complexion, aversion to cold, spontaneous sweating, slow and weak pulse. This morbid state was described as "deficiency of yang leading to cold" in Huangdi Neijing. Relative decline of yin refers to deficiency-heat syndrome due to insufficiency of yin fluid that fails to restrain yang-heat and nourish the viscera. The usual clinical symptoms are reddish complexion, tidal fever, night sweating, thin and rapid pulse. This morbid state was described as "deficiency of yin leading to heat" in Huangdi Neijing. Since yin and yang depend on each other and no one can exist without the other, relative decline of yin or yang may affect each other with the development of pathological changes. That is to say that prolonged deficiency of yin will lead to deficiency of yang and protracted deficiency of yang will bring on insufficiency of yin-fluid, eventually resulting in deficiency of both yin and yang. When relative predominance of yin or yang and relative decline of yin or yang become extremely serious, it will lead to declination of healthy qi and bring on special changes of pathogenesis known as "loss of yin" and "loss of yang"; which consequently cause death due to separation of yin and yang. The occurrence development and changes of disease, according to the theory of yin and yang, lie in the imbalance between yin and yang. Clinically all kinds of diseases, including pathological changes of complexion, voice and pulse condition as well as the nature of diseases, can be generalized and analyzed with the theory of yin and yang. Diagnostically, the theory of yin and yang can be used to analyze the data collected with the four diagnostic methods and differentiate the nature of disease, which is an important method for making correct diagnosis. That is why it is said in Huangdi Neijing that one should "observe complexion and take pulse, differentiating yin and yang first." Take complexion, voice, disposition, nature of disease and pulse for example. Bright complexion pertains to yang while grayish complexion to yin; sonorous voice pertains to yang while low and weak voice to yin; preference for cold and aversion to heat pertain to yang while preference for heat and aversion to cold to yin; floating, slippery, rapid and full pulse states pertain to yang while deep, unsmooth, slow and thin pulse conditions to yin. In syndrome differentiation, syndromes are usually differentiated from the aspects of yin and yang, external and internal, deficiency and excess, cold and heat which are the general principles for differentiating disease and syndrome, known as "syndrome differentiation with eight principles". Among these eight principles, yin and yang are regarded as the general ones. According to such a gradation, external syndrome, excess syndrome and heat syndrome are yang syndromes while internal syndrome, deficiency syndrome and cold syndrome are yin syndromes. The theory of yin and yang are also used to differentiate visceral syndromes. Take visceral deficiency syndrome for example. It can be divided into heart-yin deficiency, heart-yang deficiency, kidney-yin deficiency, kidney-yang deficiency, spleen-yang deficiency and liver-yin deficiency. Clinically the basic principle for differentiating syndrome is to differentiate yin syndrome and yang syndrome. Since the basic pathogenesis of relative predominance of yin and yang is the exuberance of pathogenic factors, the treatment must follow the therapeutic principle that "excess should be reduced". To be specific, excess-heat syndrome due to the exuberance of pathogenic factors of yang nature should be treated by clearing away heat while excess-cold syndrome due to the exuberance of pathogenic factors of yin nature should be treated by eliminating cold. Further development of relative predominance of yin and yang may lead to consumption of yin-fluid by yang-heat or impairment of yang-qi by yin-cold, which should be treated by elimination of pathogenic factors in combination of the deficiency-supplementing therapy, i. e. Combination of the therapy for clearing away heat with the therapy for nourishing yin or combination of the therapy for eliminating cold with the therapy for tonifying yang. Since the basic pathogenesis of relative decline of yin and yang is insufficiency of the healthy qi, the treatment must follow the principle that "deficiency should be supplemented";. To be specific, deficiency-cold syndrome due to insufficiency of yang-qi should be treated by nourishing yang while deficiency-heat syndrome due to deficiency of yin-fluid should be treated by nourishing yin. Further development of relative decline of yin and yang may lead to deficiency of yin due to prolonged deficiency of yang or deficiency of yang due to protracted deficiency of yin, bringing on deficiency of both yin and yang which should be treated by nourishing both yin and yang or mainly nourishing yang with the consideration of yin or mainly nourishing yin with the consideration of yang. TCM (Traditional Chinese Medicine) believes that all drugs possess four properties, five flavors and four acting tendencies (namely ascending, descending, sinking and floating) which are generalized according to the theory of yin and yang. The four properties refer to cold, hot, warm and cool nature of drugs. Drugs of hot and warm nature pertain to yang while drugs of cold and cool nature belong to yin. The former are usually used to treat cold syndrome while the latter to treat heat syndrome. The five flavors refer to acrid, sweet, sour, bitter and salty tastes of drugs. There is another flavor known as bland which is not as distinct as any of the five flavors. Drugs of different flavors bear different effects and are categorized differently in terms of yin and yang. For example, acrid flavor disperses, sweet flavor nourishes and bland flavor oozes. So the acrid, sweet and bland flavors pertain to yang. Sour flavor astringes, bitter flavor purges and salty flavor moistens. So the sour, bitter and salty flavors pertain to yin. The concept of ascending, descending, sinking and floating is a generalization of the acting tendencies of drugs. Drugs tending to ascend and disperse pertain to yang while drugs tending to descend and tranquilize pertain to yin. To generalize the properties and acting tendencies of drugs with the theory of yin and yang is to guide clinic differentiation of syndrome. Clinically only when relative predominance or decline of yin and yang is clearly differentiated, correct therapeutic principles are decided and proper drugs are selected according to their properties, flavors and effects can satisfactory curative effect be obtained and therapeutic aim be realized.